While many car enthusiasts are familiar with the concept of VW-based dune buggies of the 1960s and 1970s, and many might even know the Meyers Manx for its bug-eyed headlamps and krazy kandy colors, what is not immediately clear is the extent to which this industry boomed. However, one visit to the Dune Buggy Archives will clear that right up, and the difficulty of identifying these machines is highlighted by the fact that they have a searchable database in which they’ve assigned design attributes to the various cars, which you can use to identify yours. 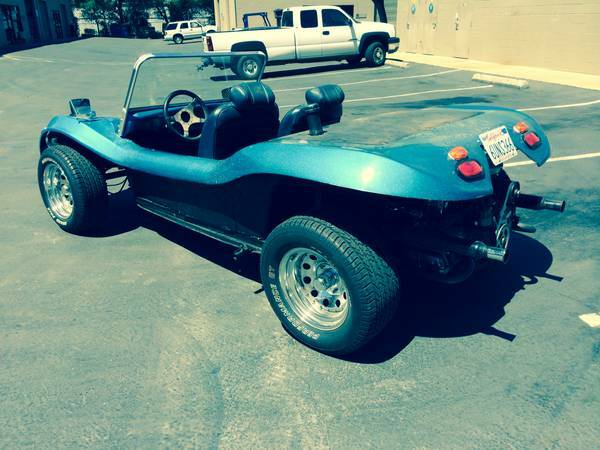 And that’s how to determine that the car identified as a 1965 VW dune buggy is actually likely to be a Jeffries Mantaray II Kyote, for sale for $3799 in Sacramento, CA. Sacramento is not really known for its dunes, but that’s not important since many of these cars were designed to be cheap fun on the road. This car appears to retain its original blue metal flake paint, adding to its desirability – many were painted over the original gelcoat when metal flake (and dune buggies, ultimately) went out of style. This car is said to have a 1500cc engine, and to run well. 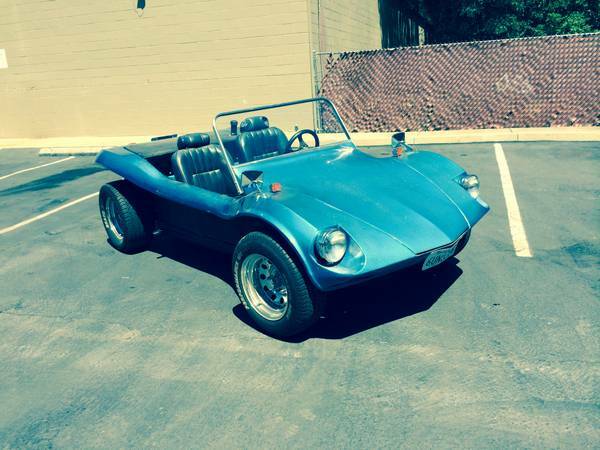 Sagging headrests suggest this buggy is equipped with seats from an early 1970s Jaguar. Whether those are really appropriate for an open car like this is another question, but they’re likely much more comfortable than what most dune buggies have. The wheels are not quite right, and you’d do better finding widened stock VW wheels or something from the aircooled VW aftermarket. Mantaray II Kyotes were originally designed for the Monkees movie “Head” by Dean Jeffries of Los Angeles, CA. Jeffries, who was prolific in the automotive business from a customizing and movie industry perspective, passed away last year. He counted Lance Reventlow and James Dean among his friends and clients, and was responsible for the Monkeemobile and the Green Hornet’s Black Beauty. With that story, and the potential for a fun ride, would you look at this car? This entry was posted on July 1, 2014 at 12:48 pm and is filed under Feature. You can follow any responses to this entry through the RSS 2.0 feed. You can leave a response, or trackback from your own site.